MotoGP riders have been summoned to a meeting before the final race of the season amid a "damaging" feud between its two biggest stars. Championship leader Valentino Rossi is appealing against a penalty imposed for clashing with defending champion Marc Marquez, who came off his bike at the Malaysian Grand Prix. The sport's president Vito Ippolito described the atmosphere as "poisoned" before Sunday's race in Valencia. Rossi starts at the back of the grid. However, the Italian nine-time world champion has taken his case to the Court of Arbitration for Sport (Cas), seeking annulment or reduction of the penalty. Rossi, 36, holds a narrow seven-point lead over Yamaha team-mate Jorge Lorenzo and must finish second if the Spaniard wins the race, in order to win the championship. 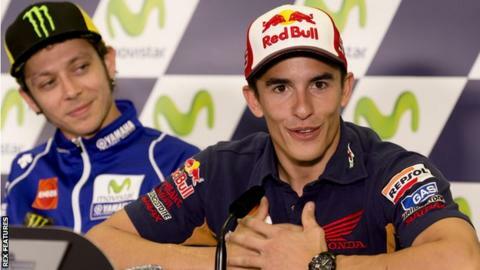 Before the race in Malaysia, Rossi accused Spaniard Marquez of deliberately trying to impede him during the Australian Grand Prix on 18 October in order to help compatriot Lorenzo. A statement from the International Motorcycling Federation (FIM) said a meeting, to also include team managers, has been called "given the exceptional circumstances". Shuhei Nakamoto, vice president of Marquez's Honda team said on Monday that he hoped Rossi would "think it over and understand his mistake". Ippolito previously warned the sport was "moving away from the tradition of pride in sportsmanship that is part of the heritage of motorcycling".